With 70 percent of illegal entries In America made through failing doors, it's good to know that steel-edged metal doors outperform most all other makes and models when it comes to strength and security. It pays to go shopping since most manufacturers sell metal doors with a wide range of ratings and structural reinforcements. Combined with high-quality deadbolts and reinforced windows, a metal door can make all the difference when it comes to peace of mind. 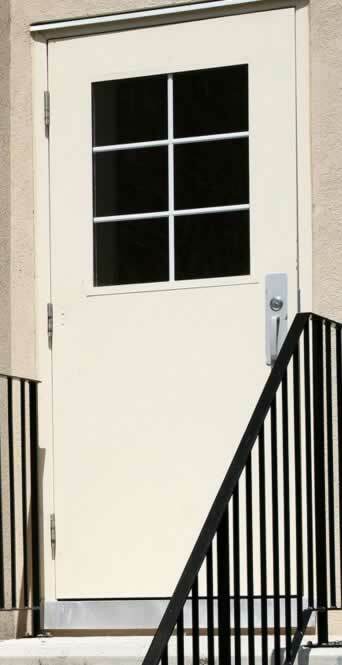 Ask for door-strike reinforcements, metal strips that protect the integrity of the door as well as to the lock hardware. For added protection, install your metal door with hinge screws that prevent the collapse of the door when hinge pins are removed. Notice that, for added security, this metal door was installed without visual obstructions from decorative work or shrubs. A high-quality metal security door combined with a sturdy front-entry door should put your fears to rest.